I am always pleased to host WOW: Women on Writing authors. Today, Kathleen Pooler, the author of Ever Faithful to His Lead: My Journey Away from Emotional Abuse, has shared some thoughts on memoir writing and the insidious effects of emotional abuse in our society. 1. What is the role of memoir in your life? I have always enjoyed writing. For years I kept a journal and it became my best friend as I struck out into the world and faced life’s challenges. And you know that old saying” there’s a book inside me”? I’ve had that feeling for as long as I can remember. In 1999, I signed up for my first formal writing course through Writer’s Digest, The Getting Started in Writing Workshop. Author Arline Chase was my mentor and she was wonderful in encouraging me to keep writing. I submitted one of my memoir pieces to the Writer’s Digest Annual Writing Competition and received honorable mention under the Inspirational category. That spurred me on to keep pursuing my dreams and in March of 2010, I attended my first national writer’s conference through Harvard Medical School in Boston where I stood before an auditorium of over 200 MDs, PhD’s and pitched my story. I have been writing with intention ever since and have found self-forgiveness, and healing in the process. I love memoir, both reading and writing and now want to share my passion with others. 2. 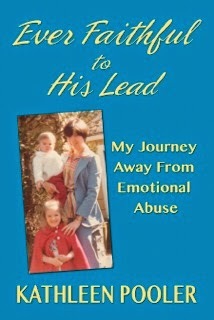 Tell us about Ever Faithful to His Lead: My Journey Away From Emotional Abuse. I started out writing a different story about the simultaneous battles of a cancer diagnosis and a beloved son’s spiral downward into substance abuse. I didn’t find my current story, Ever Faithful to His Lead, until I had written three years worth of vignettes while taking memoir writing workshops through The National Association of Memoir Writers (NAMW) with Linda Joy Myers. As I kept writing, the story that needed to be told revealed itself to me. When a developmental editor told me I had two memoirs, I realized I could not write the story of my simultaneous battle with a cancer diagnosis and a young son’s descent into substance abuse until I wrote about getting into and out of two abusive marriages. It took on a life of its own and I became connected to its purpose—to share hope with others. It is possible to climb out of the abyss of poor decisions and go on to live life on your own terms. 3. In the book, you say “a loving family, a solid career and a strong faith cannot rescue her until she decides to rescue herself.” Can you expand on that? One of the lessons I learned when I wrote this book is that I already had everything I needed within. I only needed to claim and honor my own inner strength. I was the only one who could do it for myself. It sounds so simple, but it took me years to realize this. If I can help one person connect with their own inner strength and leave an abusive relationship sooner rather than later or better yet, not even get involved in one to begin with, then my mission in writing this book will be fulfilled. 4. What do you want readers to take away from Ever Faithful to His Lead? One, one does not have to sustain broken bones or bruises to be abused. Emotional abuse is harmful and the impact on the children of mothers who are in abusive relationships is far-reaching and damaging. Two, abuse impacts all socioeconomic groups. I was a masters-prepared nurse from a loving family and yet I got into two emotionally abusive marriages. Three, denial and magical thinking can keep one from recognizing abusive behavior and taking action. Emotional abuse can lead to physical abuse. According to the National Coalition for Awareness of Domestic Violence, “One in every four women will experience domestic violence in her lifetime; 1.3 million women are victims of physical assault by an intimate partner each year; most cases of domestic violence are never reported to police.” These are staggering statistics of epidemic proportion. 5. People who have experienced abuse often struggle with guilt and shame. What's your advice on how they can deal with that? First, awareness and acknowledgement that you are indeed in an abusive situation—denial can play a big role as it did for me-- and need to get out and second develop a support system and an escape plan. Have your bags packed. This can only happen when you admit you’ve made a mistake and need to act on your fears. You need to love yourself enough to want something better for yourself. Listen to, honor and embrace your inner voice. 6. What advice do you have for people on memoir writing? I’d say find what works best for you. We all have to find own way through the process. That being said, a book does not get finished unless one develops a writing schedule and makes a commitment to stick to that schedule. Some people swear by setting daily word counts. Others write a few times per week. Whatever the schedule, there has to be a commitment to write on a regular basis and to keep writing. This is a good time to reinforce the importance of making a commitment to learn the art and craft of writing. If you want to write purely for pleasure and aren’t interested in publishing your writing, that’s fine. But if you want to write for mainstream publication, you must commit to learning all you can about writing—courses, conferences, critique groups. For me, if I don’t write, I feel it, meaning I don’t sleep well as story ideas are swirling in my head and keep me awake. So I make a point of getting my writing in during the day so I can sleep at night. I also make a point of scheduling in non-writing time. 7. What, in your opinion, constitutes a successful memoir? Good storytelling. The same techniques that make a novel good, make a memoir good—the hook, the narrative arc, the characters, sensory details, the stakes, resolution and redemption. The memoir is unique in that the narrator offers reflections and introspections on their life story and lessons learned. I have heard that a good memoir is not about you. It’s about the universal theme of your personal story that will help readers connect to their own stories. Thanks to Kathleen for stopping by and doing this interview. Please feel free to leave any additional questions or comments you might have for her in the section below. In the meantime, please look up her memoir on Amazon, and keep an eye out for her upcoming work, another memoir entitled, Hope Matters. 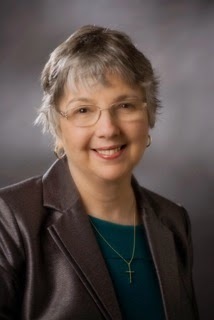 Kathleen Pooler is an author and a retired family nurse practitioner whose memoir, Ever Faithful to His Lead: My Journey Away from Emotional Abuse, published on July 28, 2014 and work-in-progress sequel, Hope Matters: A Memoir, are about how the power of hope through her faith in God helped her to transform, heal and transcend life’s obstacles and disappointments: domestic abuse, divorce, single parenting, loving and letting go of an alcoholic son, cancer and heart failure to live a life of joy and contentment. She believes that hope matters and that we are all strengthened and enlightened when we share our stories. Thank you for participating in my Wow Blog Tour, Lauren.I appreciate your hospitality. Thank YOU for sharing your work with my audience! Best of luck to you on the rest of the tour.